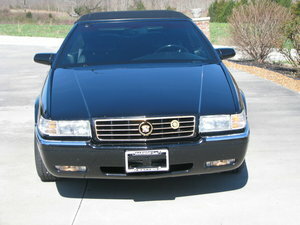 This is a very rare 1996 Cadillac Eldorado convertible as Cadillac did not manufacture Eldorado convertibles in 1996. One could purchase the 2 door Eldorado and when it came off the assembly line, it was shipped to Florida where legendary Coach Builders Limited did the conversion. Custom made for the true Cadillac enthusiast, this 1996 Eldorado convertible is a great addition to any classic car collection or a great buy for anyone with passion for rare and a unique collector car. Cadillacs have historically been known for superb engineering and extreme reliability.The current owner has kept this 1996 Eldorado convertible very well maintained and garaged. The exterior is black with excellent original paint. Chrome accents the fenders and bumpers. The cloth top is black and in new condition with excellent mechanicals.The leather interior is parchment and in very good condition. Dash and console feature wood grain accents.Engine is the Northstar V8, 4.6 liter paired with automatic transmission.Total miles are 126,400, only half of what Cadillacs typically have before a rebuild is required.This 1996 Cadillac convertible is located in North Carolina. It is available for viewing by appointment. Classic Lady Motors is not a dealer. I work by word of mouth and referral. The cars listed are owned by private collectors and individuals who do not have the time nor interest to manage the complexity of online selling. Nor do they wish to put their cars in auctions or a showroom. I manage the marketing of collectors' specialty and highline cars. I have many collectors who are looking to buy, sell, or trade. My job is to match the buyer and the seller. My clients' cars are located all over the country.